A murder in a garden turns the four new owners of Yon Bonnie Books into amateur detectives, in a captivating new cozy mystery novel from Molly MacRae. Set in the weeks before the annual Inversgail Literature Festival in Scotland, Plaid and Plagiarism begins on a morning shortly after the four women take possession of their bookshop in the Highlands. Unfortunately, the move to Inversgail hasn't gone as smoothly as they'd planned. First, Janet Marsh is told she'll have to wait before moving into her new home. Then she finds out the house has been vandalized. Again. The chief suspect? Una Graham, an advice columnist for the local paper―who's trying to make a name for herself as an investigative reporter. When Janet and her business partners go looking for clues at the house, they find a body―it's Una, in the garden shed, with a sickle in her neck. Janet never did like that garden shed. Who wanted Una dead? After discovering a cache of nasty letters, Janet and her friends are beginning to wonder who didn't, including Janet's ex-husband. Surrounded by a cast of characters with whom readers will fall in love, the new owners of Yon Bonnie Books set out to solve Una's murder so they can get back to business. 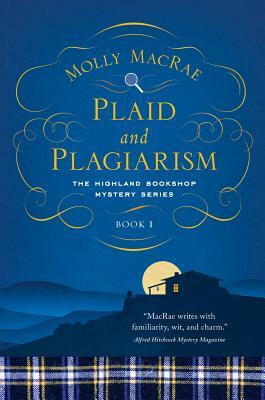 A delightful and deadly new novel about recognizing one's strengths and weakness―while also trying to open a new book shop―Plaid and Plagiarism is the start of an entertaining new Scottish mystery series.